The upcoming Jordan Mixed Open will make history, seeing women and men competing in the same event for a single prize fund. 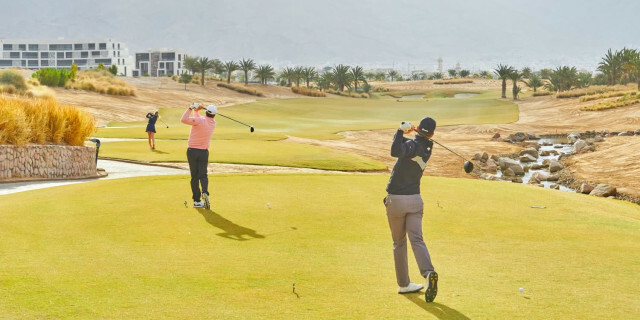 Bringing together the Challenge Tour, Staysure (Senior) Tour and Ladies European Tour, players from all three circuits will be united at the Greg Norman designed Ayla Golf Club, with different tees ensuring that it's a level playing field. The course set-up will see the Challenge Tour players tee-up from 7,152-yards, with the Staysure Tour players competing from a scorecard reduced by seven per cent, at 6,601-yards. There will then be a further seven per cent reduction for the Ladies European Tour players, who will compete from a scorecard measured at 6,139-yards, which, as is the case for all three tours, is comparable to the length the competitors would play from under standard tournament conditions. Stars from across the world of golf have given their backing to this exciting tournament, which marks the first time in history that male and female golf professionals will compete alongside each other in a full field event over the same course for a single trophy. Ladies European Tour winner Meghan MacLaren, who created headlines last month when she highlighted golf’s gender pay disparity, former Ryder Cup player Barry Lane and Senior LPGA Champion Trish Johnson are among several other notable players who will tee it up at the spectacular Red Sea venue for the co-sanctioned event, including the husband and wife pair of Kylie and Scott Henry. The layout has been specifically set-up to ensure competitors from each circuit can compete over an equal playing field, with bunkering and hazards, alongside tee placement, taken into consideration. The event should be compelling and may potentially point to a future pathway for the game to become more inclusive and diverse.